Seventeen people were arrested on Monday after staging a sit-in at the office of incoming Senate minority leader Charles E. Schumer. About 40 people called on the New York Democrat to step aside from the position and allow Vermont independent Sen. Bernie Sanders to take it. Capitol Police spokeswoman Eva Malecki said those arrested were charged with blocking or obstructing a public space. They were taken to Capitol Police headquarters for processing. “People here are either going to meet with Schumer or get arrested,” said Waleed Shahid, a leader of the group All of Us 2016, which organized the protest, before the police moved in. Two staff assistants stared at their computer screens in Schumer’s Hart Building office while trying to ignore the spectacle in front of them. The protest began at about 11:30 a.m. 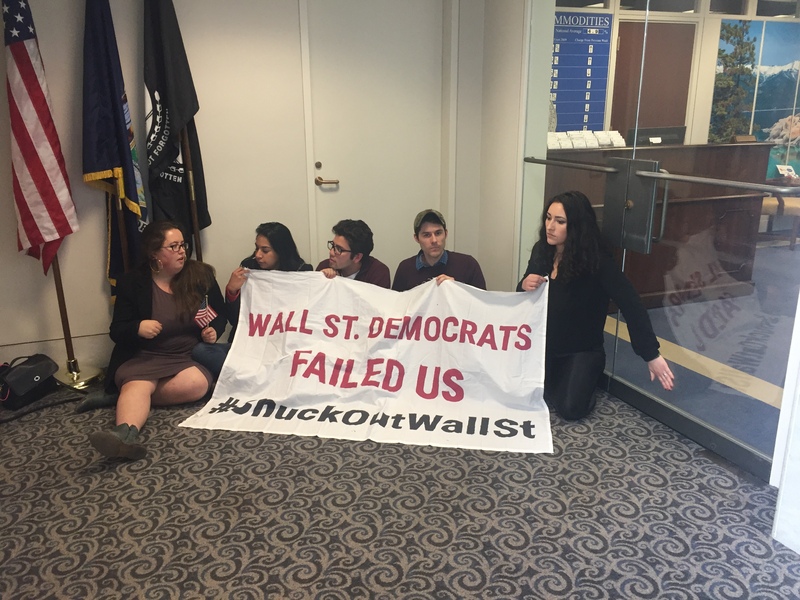 The group said they hoped this would be the start of many protests against “Wall Street Democrats,” whom they blame for Donald Trump’s election as president. Aside from Sanders, All of Us 2016 would also support Massachusetts Sen. Elizabeth Warren for minority leader because she has also “repeatedly tried to change the party in a different direction,” Shahid said. Protesters continued to sing while sitting in front of the office as Capitol Police periodically arrested them. Shortly before 1 p.m., one of the demonstrators stood up to explain the group’s cause. She said Monday&apos;s protest was a "first warning" to Democrats who say they would work with Trump. "Democrats must refuse to negotiate with a racist fascist," she said. “A lot of us are willing to go to jail,” he added.